The present magnificent Katholikon of the Monastery, that is honoured in memory of All Saints, was erected in 1541/42 by the two brothers priest-monks from Ioannina T h e o p h a n i s († 17th May 1544) and N e k t a r i o s († 17th April 1550) Apsaras. The Katholikon has typical, elegant, Athonite style and its main church is two columned, cruciform, inscribed with the two typical conches of Mount Athos (the choirs). The nave is preceded by an ample esonarthex (lite) with a nice dome in its center, equivalent to the one of the nave, supported by four columns. 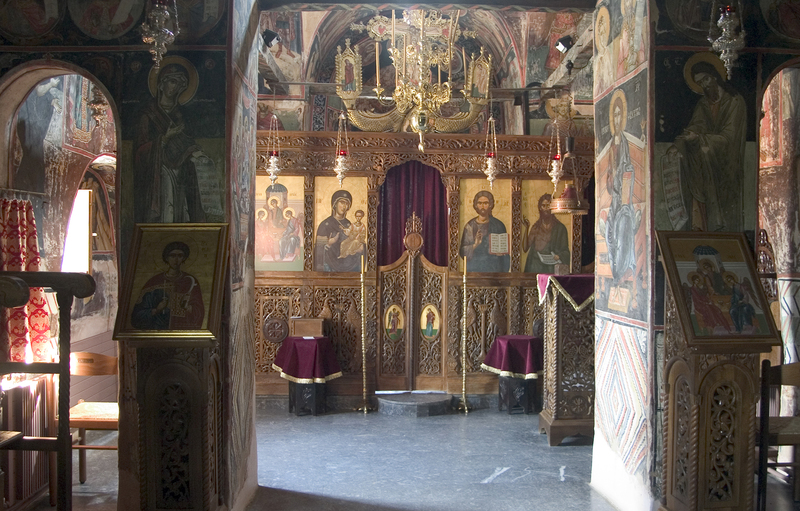 Remarkable for their fine and elaborated art are the woodcarved gilded iconostasis of the nave of the katholikon, the throne of the Superior and two lecterns with rich decoration of ivory; the inscription in one of them informs that they were made during the bishopric of Paisios [Kleinovitis, 1784-1808] of Stagoi and the abbacy of Anatolios.